Masha Bennett is one of our Guest Speakers from the UK who will be presenting an amazing Gong Experience for both our delegates and their animal companions alike. Masha Bennett is a Russian-born psychotherapist, trainer and sound healer. In her early career she worked at Moscow Zoo, before moving to the UK and re-training as a gardener and botanist, and then unexpectedly, beginning to work with people in 1999. Since then she has worked in prisons, probation service, addiction treatment centres, National Health Service, and in private therapy practice, at the same time pursuing her passion for animals, plants and nature in her private time. Her interest in the healing power of sound began in 2011, and in recent years she became enthused by gongs in particular, qualifying as a gong practitioner with the College of Sound Healing. Masha holds an MSc in Therapeutic Practice for Psychological Trauma from the University of Chester, she has trained some thousands of health and care professionals, both in UK and internationally, including Norway, Russia, Kazakhstan, Sri Lanka, Latvia, Lithuania, and Israel. 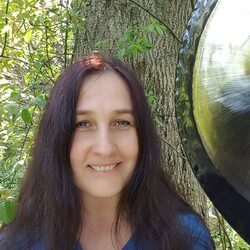 She teaches and presents on the topics of trauma, Emotional Freedom Techniques, sound healing, and other areas of health and wellbeing. She has a busy full-time therapy practice in Glossop near Manchester, where she lives with her partner, two dogs and two cats, and her way of working is currently in transition from conventional “talking therapies” to working creatively with sound, symbols, sandplay, art and nature. To read more about Masha then visit her website here. And she invites you to join her on her Gong Facebook page here.